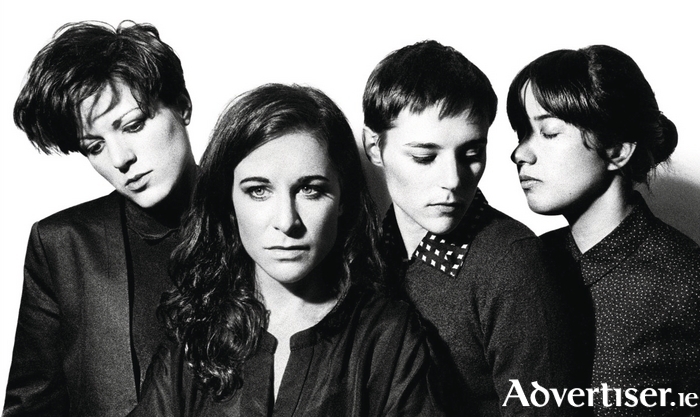 SILENCE YOURSELF was a hell of an opening statement from Savages in 2013. It was so good their over indebtedness to Joy Division, Siouxsie Sioux, and Dead Kennedys proved no hinderance, but rather a welcome way in for audiences. But there was more to Savages than the right influences. Gemma Thompson's Goth spooked guitar riffing and the atmosphere, drama, and tension of their music showed a band of real potential. Their secret weapon though was French vocalist Jenny Beth, whose breathless, ranging, delivery gave the band a distinct identity. While vague hints of The Fall and Morrissey can be heard, Adore Life finds Savages largely transcending their inspirations to create something that is more uniquely them. As such it is a progression from the debut, but the more abstract sound and style - feedback, atonality, non-traditional song structure, even in the more accessible tracks like the very fine 'Slowing Down The World' - make it more difficult, challenging, an album to admire, rather than perhaps love or enjoy. Yet, Jenny Beth reminds us why she is one of the most significant new voices in rock. Adore Life is unflinching in the themes it tackles, from the possessiveness ("If you don't love me/You don't love anybody" ), to female empowerment ("When I take a man/At my command" ), a questioning of the relevance of binary gender identities or the need to categorise human sexuality ("When I take a man/Or a woman/They're both the same/They're both human" ), to a declaration of "I adore life" over and over again on the title track. Messages to embrace. "SO SUDDENLY we had a more sober - or even sad - album than we expected. Please don't think we've turned into depressive people or something," so say young Spanish quartet Hinds (pictured above ) about their debut. They need not fear, for whatever about the lyrical themes - and what is indie music without melancholy, angst, and feeling estranged from the world around you? - musically these 12 tracks burst with warmth and exuberance in a jangly, ramshackle, loose and lo-fi manner, and all the better for it. This is music deeply in thrall to the heritage and traditions of classic indie music - with elements of garage rock and fifties/sixties girl group pop - without Hinds being mere revivalists or copyists. Rather, this is about essential indie values being transmitted to a new generation of listeners. A strong sense of melody and pop hooks are obvious in 'Castigadas En El Granero' and 'Chili Town', while instrumental 'Solar Gap' has beauty, poignancy, and hope in its lovely guitar lines.